Left to right: Curtis Morris, James Holsomback, Chief John Clark, Roger Bush, Assistant Chief Mart Adams, Mayor Andy Livingston. Not pictured: Chris Rosier, Chris Derrick and Mike Casey. 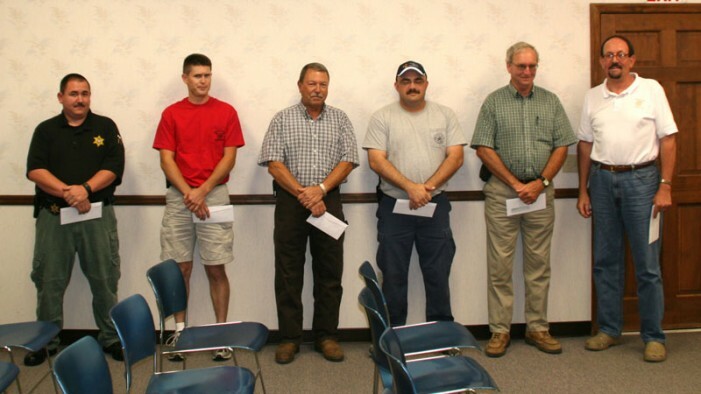 The first order of business conducted during the May 2012 Johnston Town Council Meeting was to express the town’s gratitude for the services rendered by volunteer firemen. Mayor Andy Livingston presented monetary awards to the volunteers that had achieved a score of 70 or above on the state proficiency criteria that are representative of percentage of response to fire calls, attendance and training completed. Volunteers, with the score required, are Mart Adams, John Clark, Roger Bush, James Holsomback, Curtis Morris, Chris Rosier, Chris Derrick and Mike Casey.